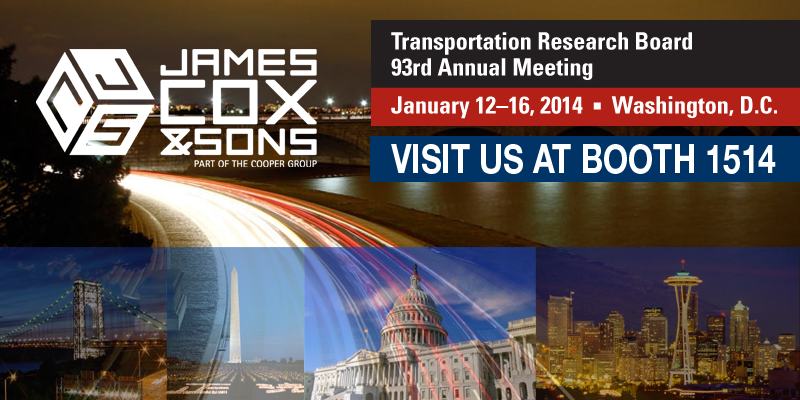 Meet us at TRB 93rd Annual Meeting, January 12-16, 2014 - James Cox and Sons, Inc. The Transportation Research Board (TRB) 93rd Annual Meeting will be held in Washington, D.C. at the Washington Marriott Wardman Park, Omni Shoreham, and Washington Hilton hotels. The information-packed program will attract nearly 12,000 transportation professionals from around the world to Washington, D.C., January 12-16, 2014. The TRB Annual Meeting program covers all transportation modes, with more than 4,500 presentations in nearly 800 sessions and workshops addressing topics of interest to all attendees—policy makers, administrators, practitioners, researchers, and representatives of government, industry, and academic institutions.